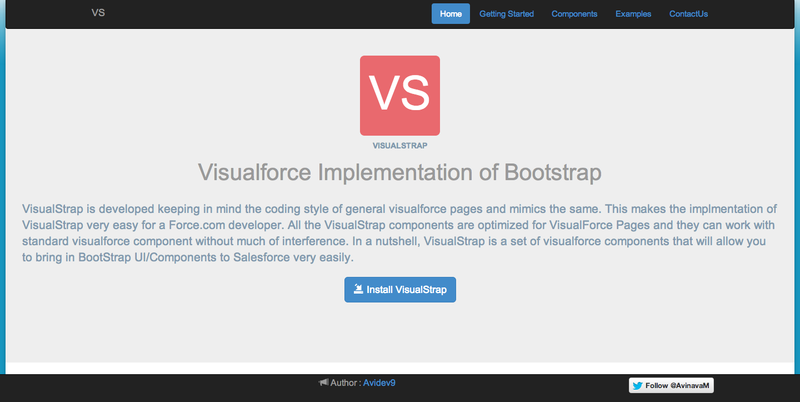 BlogForce9: Visualstrap : New Site ! Visualstrap : New Site ! Well this weekend something surprising happened, Visualstrap crossed 1000 install limit (inlcuding appexchange & from my blog). I am really excited and happy that people are finding this small little package useful. Thanks for all the support ! So to make this package more delightful and easy to learn, I have redesigned the Visualstrap site to include all the documents and instruction at one place. This site itself is an example of how you can create a good custom ui inside salesforce. I am still working on making the site better and putting all the documentation at one place. Thanks for all the support and love! Thanks so much for sharing! FYI there is a typo in the header under the graphic. Bootstrap is spelled wrong (missing the the "t"). Hope that helps! Oops.. I have somehow... Anyways I have updated the site, will update the blog soon!. Thanks! Congratulations, Just thought I'd share another surprise I was at Salesforce 1 worldtour in london a couple of weeks ago and a number of people were discussing your package in the breakout session about visualforce. Looks like I am the only one who is not aware about it :P . I am really happy people are finding this package useful !